If you’re struggling to pay a tax debt, it’s important that you know what your options are. In certain cases, you may be able to have the ATO completely release you from your tax debt. This can happen if you would suffer ‘serious financial hardship’ if you had to pay the debt. Only individuals can be released from a tax debt. This means that if you run your business through a company, a trust or a partnership, then that entity is not eligible to have its tax debt released. It may need to look at other options for dealing with the debt, such as an application for a remission of GIC or making a payment plan proposal. Only certain tax debts are eligible for release by the ATO. These include income tax, PAYG income instalments, the medicare levy, and some interest and penalties associated with these debts. The kinds of tax that are not eligible for release include GST, the superannuation guarantee charge for employees and PAYG withholding tax for employees. If you owe one of these kinds of debts, you will need to look at other options for dealing with the tax (such as seeking a remission of interest and penalties, or trying to arrange a payment plan). Your tax debt may be a combination of amounts that are eligible and ineligible for release. In this case, the ATO can still release you from the eligible amount, but will usually insist that you first pay the amount that is ineligible for release. Joel owes a total of $200,000 to the ATO. Of this, $160,000 is eligible for release and $40,000 is eligible for release. If Joel qualified for a release of the $160,000, he would still need to come up with a plan to pay the $40,000. The ATO may allow him to pay this off over time via a payment plan, or it may insist that the $40,000 is paid upfront before a release of the eligible debt can be granted. How do you qualify for a release? You qualify for a release from your eligible tax debt if you can show the ATO that payment of the amount would cause you ‘serious hardship’. The ATO interprets ‘serious hardship’ to mean that, if you paid the amount, you wouldn’t be left with enough for things such as food, clothing, medical supplies, accommodation, or education. The ATO assesses this by looking at your income, expenses, assets, liabilities and ‘other factors’. This last category is pretty broad, and means that even if your financial situation indicates there would be serious hardship, the ATO can still refuse to release you from your tax debt. Where you’ve bought investments or spent your money without giving consideration to your tax debt. 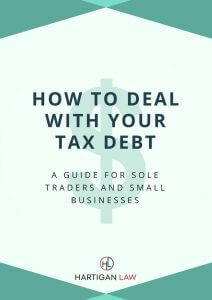 Where you have other debts (such as credit cards and personal loans), and you would still be in hardship because of those debts even if the ATO released you from your eligible tax debt. Where your serious hardship is likely only to be short term. For example, if a person is in their 30s, unemployed and of good health, the ATO may consider that they are likely to find work in the near future and that they have many working years ahead of them. In that case, the ATO may decide that the hardship is temporary and doesn’t warrant a release from the tax debt, because they will be able to pay it in the future. Where you haven’t demonstrated a plan to ensure you are able to pay your tax in the future. Have all of your tax lodgments up to date before you make the application for release. The ATO won’t be able to consider your request if you have outstanding income tax returns or activity statements. Have a plan to pay the ineligible debt. The ATO can only release you from certain debts, and it will want to know what your plan is to pay the tax debt that it can’t release. Try and work this out before you make your application – do you have money you can use to pay this amount, or can you borrow money? If not, can you pay the ineligible amount over time? Come up with a plan to be able to pay your future tax. For example, if you operate a business as a sole trader, then you should consider setting up a separate bank account for tax savings. The ATO has a form on its website that you should use to apply for a release. This form collects all of the information that the ATO needs to be able to consider your request. Include a cover letter so you can fully explain your situation. The ATO’s form asks some open ended questions, but only provides 3 lines for you to write your response to each one. This may not be enough room, so use a letter to give yourself the space to explain your situation. Download and use this spreadsheet template that I’ve put together. This will help work out your income and expenses and make sure you get your sums correct. Once you’re happy that these numbers are correct, you can copy the numbers into the application form. If you’re a sole trader, make sure your ‘business income’ in the income section of the form is after your business expenses (e.g. tools, materials, work vehicle running costs, etc). You may want to use the ‘taxable income’ from your most recent tax return as the basis for your business income. What happens if the ATO grants the release? If the ATO grants a release of your eligible debt, then the amount is expunged. This means you don’t have to pay it and it cannot be re–raised at a later date. What happens if the ATO refuses? In some cases, the ATO will encourage you to withdraw your request, because there is something about it that will result in a refusal. Usually this is an ‘olive branch’ by the ATO – it has identified an issue with your application, and wants to give you the opportunity to fix it up and then try again later. Otherwise, the ATO may outright refuse your application. In this case, you have the right to object to that decision. This means you get to explain why you think the ATO’s decision is wrong and it is reconsidered by a separate team within the ATO. If the outcome of the objection is that the ATO still refuses to grant the release, then you can seek a further review from the Administrative Appeals Tribunal. The ATO will even pay your lodgment fee for this review. You can also appeal to the Federal Court. I’ve helped many clients to deal with their tax debt, including applications for release, applications for remissions of interest and negotiating payment plans with the ATO. I have also helped clients to object to ATO decisions and appeal ATO decisions in the courts.